A lot has happened since I wrote the June Spitboy Rule book update. The book cover happened! I could barely steady my fingers to open the e-mail when I saw that John Yates, Spitboy Rule: Tales of a Xicana in a Female Punk Band, cover designer, sent files with book cover options. Seeing the book’s cover art for the first time is pretty surreal. Seeing the photo of me on drums, the word Xicana, and my full name on the cover, wow. Spitboy put out a record on John Yates’ old label, and he designed all the art for that release. It’s great to be working with him again because he’s so nice and great at what he does, asking about color palettes, choosing fonts, listening to my layperson suggestions, and laying everything out on some fancy program. We both agreed that Karoline Collins’ live photo of me in Australia captures the blur of my moving head and sticks was the right shot for the cover. I initially thought that the whole band should be on the cover, but my husband disagreed. At first, I thought it was cute he thought that I should be on the cover. Then I realized that he was right. “You wrote the book,” he said. And it became clear real quick that live band photos that feature the drummer prominently at all are a hard get. Spitboy was very wise taking friend and photographer, Karoline Collins, as a roadie on the Pacific Rim tour because she had full- stage access, and she just got up in there to get the shots she wanted and thought we should have. I also collected blurbs or endorsements; you know the nice things that people say about the book that are printed on the back of the jacket. It turns out that getting these endorsement can be very tricky. I upset an old friend in the process, but I did get several other great endorsements, including one from Alice Bag — that one was practically required. In spite of what I perceived to be a misunderstanding – the friend would say I was being too businesslike, trying to sell books. That part is true. I do want to sell a lot of books. On a small press, selling a lot of books will not mean making a bunch of money, but it could mean a bunch of readers. Writers, including the upset one, love imagining people reading their words. It’s also true that I had to get an endorsement from Alice Bag. I know this sounds strange, but I’ve gotten the sense that this how these things work. Alice Bag wrote one of the first, if not the first, punk rock Latina memoirs, not having her endorsement on my book which follows hers by about five years (at time of release) would not go unnoticed by people in the business. She could have said no. She could have been too busy, and actually I think she was, but Alice Bag read, liked, and wrote nice things about my book. Pinche me, seriously, pinch me! Another thing I did over the summer was spend a lot of time sorting through my own collection of Spitboy photographs and reaching out to people who photographed us. A bunch of really nice people and great photographers have been kind enough to send photos they took of Spitboy back when we were all still using film. This means photos had to be scanned and organized digitally – thanks to everyone who helped out – Ace Morgan, Chris Boarts Larson, David Sine, Karoline Collins, and Lyn Lentil. I was, along with news of the upcoming book, featured on two websites Paste Magazine and Flavorwire, thanks to Shawna Kenney and Jess Skolnik. I was featured along with Alice Bag in Paste Magazine’s “8 Old-school Punks Doing Cool New Things” and interviewed by Skolnik for Flavorwire as a part of her “Forgotten Women in Punk Rock” series. Jess Skolnik did a lot of homework before she interviewed me, which helped her to write great questions, which made me sound really smart – something I know I am, but I am often credited for other things, things like being articulate, driven, feisty, businesslike, feisty, and exotic, yes, exotic. 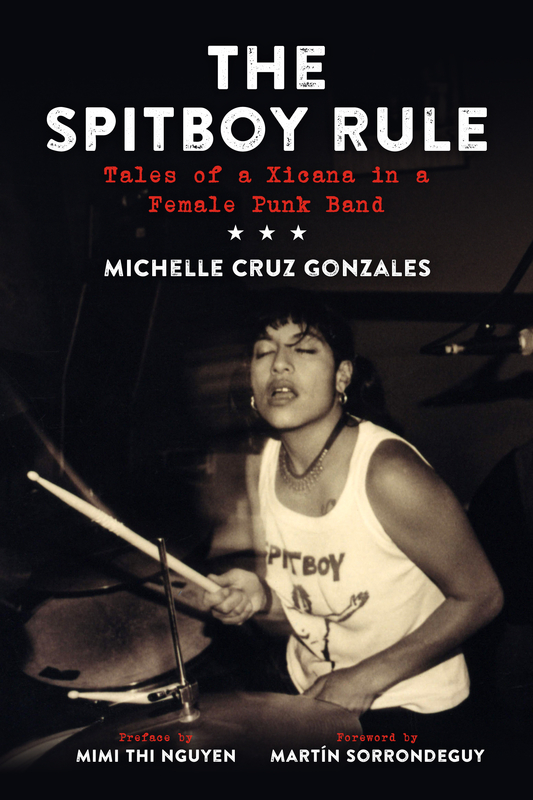 The official release date for the PM Press publication of The Spitboy Rule: Tales of a Xicana in a Female Punk Band is April 2016, but there will be copies available at AWP, which takes place in LA in March, and I will be there all excited and trying not to cry because I’ll be so happy. There will be some readings too, so watch out AWP, here comes one Xicana that you never saw coming. I don’t write about corn, goddesses, the Catholic church, bright colors, or the homeland, unless that homeland is California, and I don’t teach in an MFA program, but I do teach community college. 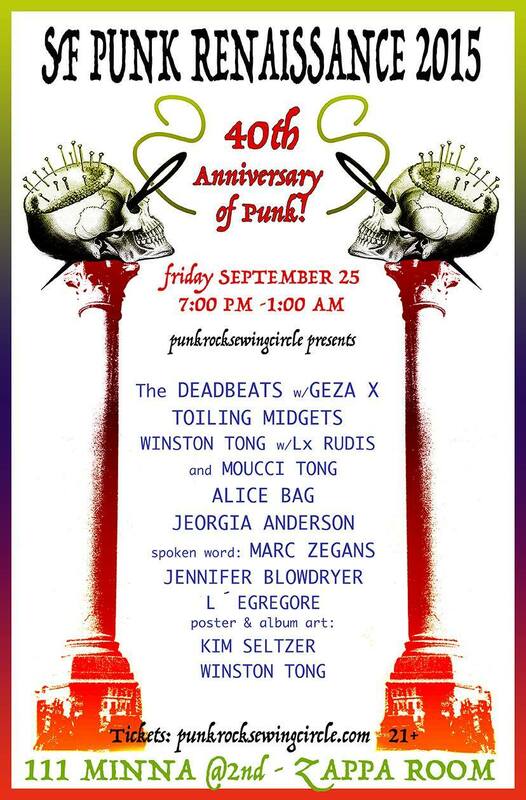 In the meantime, come see me read from the book and play drums in Alice Bag’s band at 111 Mina in San Francisco – Punk Rock Renaissance Show on Friday, September 15. Yes, I get to play music with Alice Bag. Pinch me!